← Sutro Stewards: The Good, The Bad, and the… ??? In recent weeks, we’ve had several developments regarding Sutro Forest. 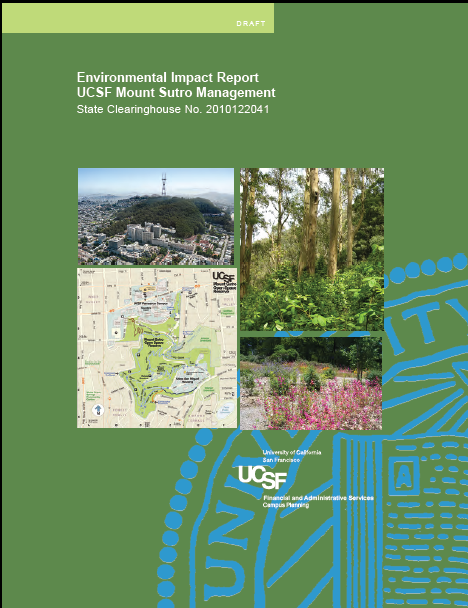 UCSF has compiled and published the public comments on the Draft Environmental Impact Report (DEIR). 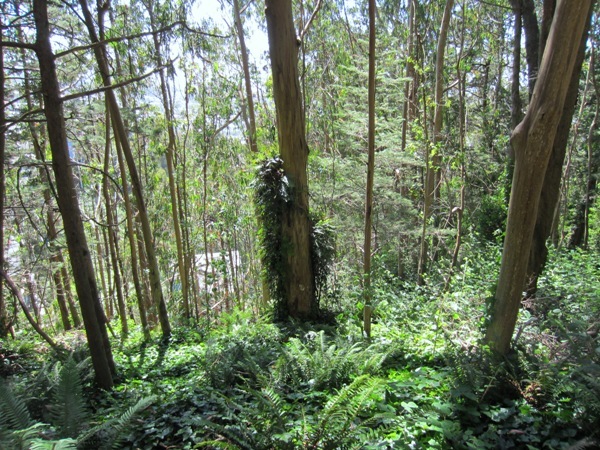 Though the comments are meant to address the DEIR, many commenters treated it as a referendum and showed their support for preserving Sutro Forest as it is. UCSF received 189 comments; 164 opposed the plan, and only 20 supported it. Another 5 were ambivalent or supported part of the plan and opposed other aspects of it. That’s a ratio of 8:1 in favor of preserving Sutro Forest. The next step will be for UCSF to respond to the comments and publish the final EIR; after that, the University of California’s Board of Regents will need to certify that the EIR is complete, and then they can approve the project. Tree-felling in the Demonstration Areas could begin by mid-August after the bird nesting season. Ron Proctor made an 8-minute video about Sutro Forest, showing the Demonstration Area plans. Please do take a look, and share it with others who may be interested. The April 21st meeting drew around 30 energized supporters, who are taking the initiative to spread the word. We had presentations on Sutro Forest, Mount Davidson (where 1600 trees are to be felled), and the San Francisco Forest Alliance’s mission to preserve public parks for the public. We hope to make these presentations available online soon. At the meeting, Dr Morley Singer talked about a new article in the (peer-reviewed, highly-respected) journal of the American Cancer Society, reporting a link between cancer and pesticides. SFForest.net reported on that in an article called Pesticides and Cancer, Glyphosate and Gut Bugs. It pointed out that one of the pesticides specifically mentioned was glyphosate (Aquamaster/ Roundup), and also discussed an article that showed glyphosate could adversely affect the friendly bacteria in human intestines, causing health issues. Glyphosate is one of the pesticides that UCSF could potentially use in Sutro Forest. 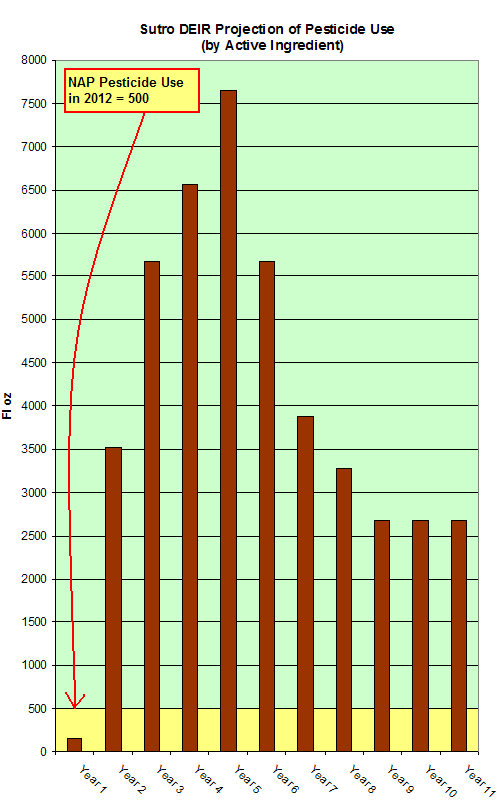 We obtained some Sutro Forest cost information from UCSF. The meetings held in 2009 and 2010 and all the outreach cost around $52 thousand. Preparing the EIR is budgeted at $275 thousand, all of it to outside consultants or contractors. (They don’t appear to keep track of the time spent by their own employees, though it’s clearly substantial.) Most of this amount came from the Campus Planning budget, but $65 thousand came from the Chancellor’s Fund. We are still trying to get estimates of the cost of implementing the Management Plan. This entry was posted in Environment, Mt Sutro Cloud Forest, UCSF and tagged environment, Environmental Impact Report, Sutro Forest, UCSF. Bookmark the permalink. Well-done video but so scary. Why must humans mess with Ma Nature excessively like this? Was there yesterday and saw far too many felled trees and orange dots — already.